Transit stops enhance the experience of waiting for and boarding transit vehicles. Successful transit stops are well connected to the local network of sidewalks and pedestrian routes, and provide convenient connections to residences, work places, and other destinations. Sidewalk transit stops should be located in a curb extension wherever possible. See Transit Bulb-Outs. Transit stops should be located in median islands where transit uses center lanes. See Transit Boarding Islands. At signalized intersections, transit stops should typically be located at the far side of intersections to facilitate bus operations, transit signal priority, and pedestrian movement. This also enables the crossing to be located behind the bus, which is preferable for pedestrian safety. At stop signs, transit stops should typically be located near side. Contact the SFMTA for transit stop location guidelines. Transit stops should be located in places that are active and visible to maximize personal security of waiting transit users. Transit stops should not be located at driveways wherever possible; new driveways should be discouraged at transit stops (and generally along major transit routes). Good layout of a transit stop oﬀers transit patrons visual cues on where to wait, clearly deﬁnes the transit stop and calls it out as a special place in the sidewalk environment, allows ease of access between the sidewalk, the transit stop, and the transit vehicle, and does not block the path of travel on the adjacent sidewalk. 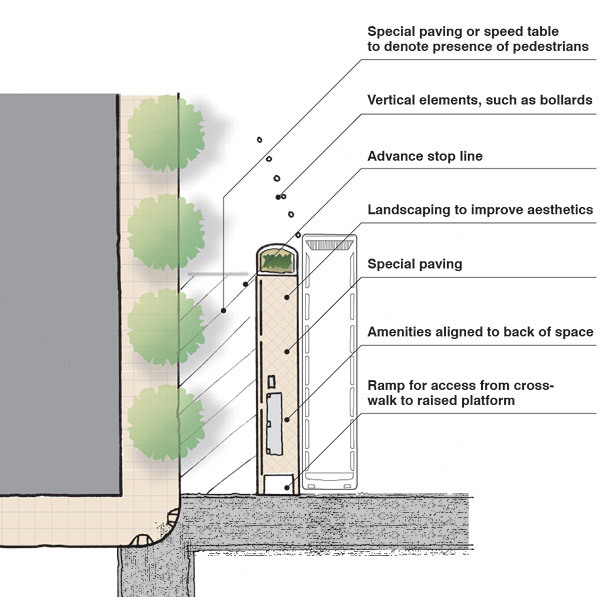 Streetscape elements should be consolidated to create clear waiting space and minimize obstructions between the adjacent sidewalk, waiting areas, and boarding areas. Streetscape elements should be evenly spaced throughout the transit stop for ease of access. They should be aligned for ease of detection by people with visual impairments. 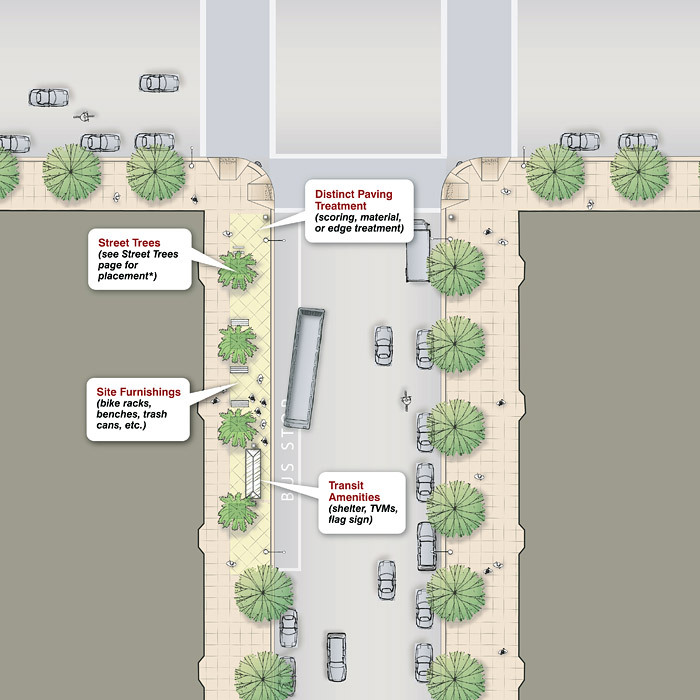 Transit stops may be distinguished from the adjacent sidewalk through the use of special paving treatments, curb extensions, or a row of trees or planters, where space allows. Use of a diﬀerent species of tree than the prevailing block pattern can help to diﬀerentiate the transit stop. These treatments are most appropriate on the Muni Rapid Network or at major transfer points. Transit stops should be integrated with adjoining activity centers wherever possible to activate and create a safe space. A clear 5 foot by 8 foot loading area perpendicular to the curb, with a maximum 2% cross-slope, to allow a transit vehicle to extend its ramp to load people with mobility impairments. The clear loading area should be at the front of the boarding zone and accessible from the transit shelter (where present) and adjacent sidewalk. If a zone is designed for more than one bus, a wheelchair loading zone should be provided for each vehicle. A 30 inch by 48 inch clear ﬂoor wheelchair space within the transit shelter (where present). This space must be accessible from the sidewalk and the loading area. In some cases, this may necessitate removing one of the panels at the rear of the transit shelter. Where boarding platforms are not level with the sidewalk, an accessible ramp must be provided from the sidewalk to the platform. Flag signs should be placed near the front of the stop, to indicate where passengers should wait to board the vehicle. At far side or mid-block stops with bus zones, the ﬂag sign should be placed approximately 25 to 35 feet behind the front of the stop to allow for the bus to pull out of the stop and re-enter traﬃc. At near side zones, or where there is a transit bulb-out or boarding island, this setback is not necessary. When modifying sidewalks at existing or new transit stops, evaluate adding electrical systems to provide power for shelter amenities such as lighting and real-time information. Ticket vending machines (TVMs), where provided, should be located near to transit shelters within the transit stop. At transit stops where a proof-of-payment (PoP) zone is used, ticket vending machines should be placed outside the paid zone, not next to the transit shelter. At some surface transit stations (typically BRT or LRT stops), a proof-of-payment system may be used, with a paid zone inside which patrons are required to have proof of payment (transit ticket or pass). The paid zone may be limited to the vehicle, or it may be a waiting area on the sidewalk or boarding island, similar to the area in subway stations inside the fare gates. Patrons without a transit pass would purchase a ticket through a machine at the entrance to the station and then wait in the boarding area. Those patrons on the boarding area without a pass or ticket would be subject to fines. 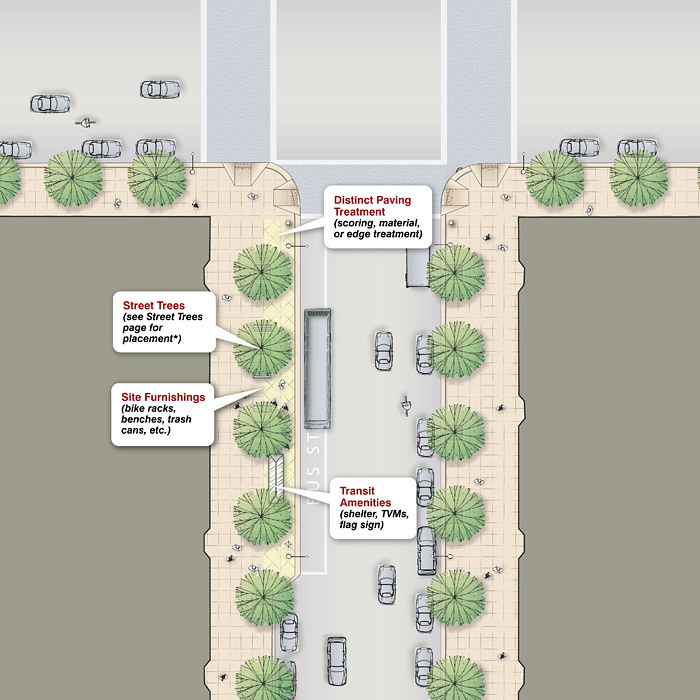 The paid zone should be differentiated from the sidewalk or median, using design elements such as special paving, grade changes, planters, bollards or other features. This may or may not include literal gates or turnstiles to enter the paid zone. 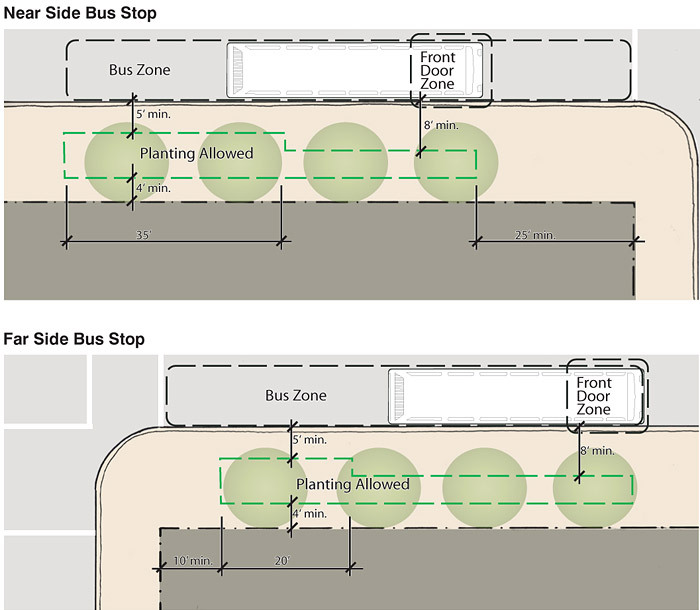 Paid zones should allow permeability to the adjacent sidewalk to enable transit passengers to easily enter the zone (passengers should not have to take a circuitous route to enter the paid zone), but create distinct entry points that make it clear to sidewalk users that they are entering a paid transit area. TVMs should be located at the entrance to the paid zone, not adjacent to the transit shelter. Stations may need to incorporate a forecourt area outside the paid area with TVMs at the inner (station entrance) end to avoid congestion in crosswalks or at corners resulting from queuing at TVMs. Trees and planters may be used to distinguish the transit stop from the adjacent sidewalk area or to continue the prevailing pattern of tree planting along a block, but should not interfere with transit operations or pedestrian travel. This may often mean that, where space allows, street trees in a transit stop would not be along the same alignment as trees on the rest of the block. This can help call out the transit stop as a special location on the sidewalk; in these cases, selecting tree species distinct from the prevailing tree species on the street can enhance this eﬀect. This treatment is most appropriate on LRT, BRT, or other Rapid Network lines, or at major transfer points. See Street Trees for the correct placement of trees and landscaping at transit stops. Stormwater facilities may be located within transit areas; however they should not impede the ability to access the transit shelter (where present), or boarding areas. Stormwater facilities appropriate to transit stops include permeable paving in the sidewalk area, building-adjacent planters, or covered channels. Lighting should be located to illuminate the transit stop area, particularly the front of the stop and the transit shelter (where present). Lighting may be integral to the transit shelter, or may be provided by standard pedestrian or roadway lighting, where suﬃcient. Special sidewalk paving may be provided to distinguish the transit stop area from the adjacent sidewalk. Special sidewalk paving may include a unique scoring pattern, a contrasting paving material, or a paving edge treatment delineating the edge of the transit stop. Special paving may be expensive, and is most appropriate at major stops on LRT, BRT, or other Rapid Network lines or at other major transfer points. Other street furniture should be located within transit stops as follows. Seating should be located within the transit shelter (where present). Additional seating, either formal (benches, seats with armrests) or informal (bollards, low seat walls, leaning bars), may be placed outside of the shelter, provided it allows permeability to and from the transit shelter and boarding area. Trash cans should be placed adjacent to the transit shelter (where present). Bike racks, where provided, should be placed near the back of the transit stop (further from the shelter (where present), or be placed outside of but adjacent to the transit stop. Bike-sharing pods, where provided, should be placed outside of but adjacent to the transit stop. Wayﬁnding information may be located within transit stop areas, particularly in downtown, commercial, or touristed areas. Service amenities and design should be consistent across service categories (Rapid, Local, Community) to increase the legibility of the Muni system. Transit stops on LRT, BRT, or other Rapid Network corridors and at major transfer points should include a greater level of features and amenities than other locations. LRT, BRT, and other special lines should be designed to have a distinct identity and be “branded” to emphasize their special nature. Special treatments for transit stops along these lines may include special signage, unique transit shelters, TVMs, special paving or landscape treatments, premium materials, and higher numbers of amenities at each stop. At major transfer stops, stop design should facilitate clear, safe, and comfortable transfers. Designs may include wayﬁnding signs, real-time transit information, a clear path of travel between stops, a consistent paving treatment, or other visual cues to link facilities. Appropriate pedestrian safety measures, such as high visibility crossings, curb extensions, or pedestrian-priority signal timing should be prioritized at major transfer points. See Crosswalks, Pedestrian Signals, and Curb Extensions. * see Street Trees page for locating trees on station. Bus bulbs are curb extensions that serve a transit stop. Bus bulbs can improve transit performance by eliminating the need for transit vehicles to exit and re-enter the ﬂow of traﬃc at each stop. They also facilitate accessible boarding as the bus can align directly with the curb. Bus bulbs improve pedestrian conditions by providing extra space for waiting and passing pedestrians and providing a space to locate transit shelters out of the way of pedestrian ﬂow. Where transit performance is slowed signiﬁcantly due to the time delays caused by reentering traﬃc ﬂow, and a bus bulb will mitigate this problem. Bus bulbs have traditionally been placed on streets with two or more lanes per direction so that vehicles may pass a stopped bus on the left. Bus bulbs may also be considered on streets with one lane in each direction, subject to a case-by-case evaluation. Where they are placed on streets with one lane in each direction, they may be staggered to allow space for vehicles to pass a dwelling bus. At ﬂag stops with no bus zone, pedestrian bulbs could be extended to reach the front door of a boarding bus at near side stops. Due to the high cost of constructing and removing bus bulbs, the ultimate stop spacing for a route should be determined prior to their installation, as stops may be shifted or consolidated. Bus bulbs should follow the transit stop layout guidelines above. They should follow all curb radius and curb extensions guidelines and dimensions. Bus bulbs should be long enough to accommodate all doors of transit vehicles that will load and unload at the curb extensions plus an additional 5 feet of maneuvering space. Where there is frequent service, such as on BRT or Rapid Network lines, they should be long enough to accommodate two or more vehicles, with a 5 foot space in between. They should leave 10 feet at the back of the bus zone to prevent following cars from blocking the intersection. 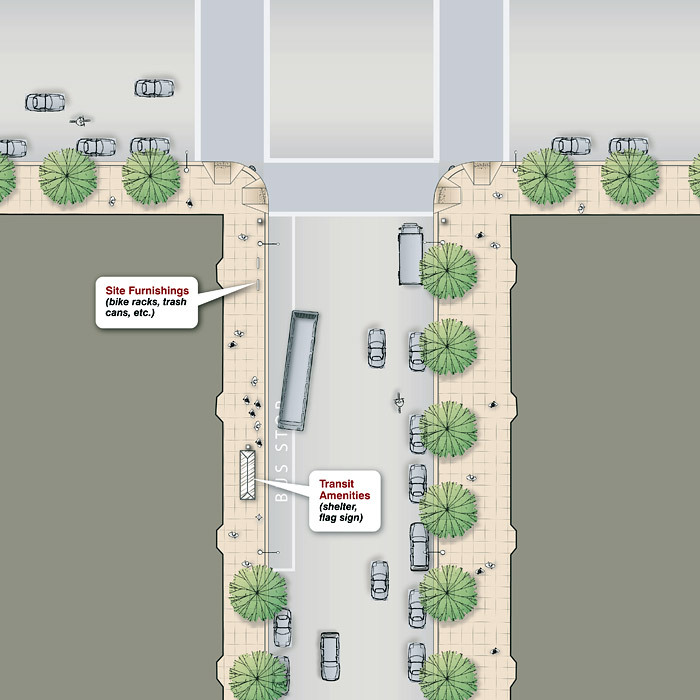 Where bus bulbs are provided, streetscape elements including street trees may continue along the same alignment as the rest of the block. The bus bulb may use special paving treatments or distinct tree species to distinguish it from the adjacent sidewalk. * see Street Trees page for locating trees on bulb-out. Transit boarding islands are waiting areas located on a median. Transit boarding islands can improve transit performance where vehicles run in the center lane, and do not have to exit and re-enter the ﬂow of traﬃc at each stop. On multi-way boulevards with transit running in center lanes, the side medians should act as transit boarding islands. Transit boarding islands may also improve pedestrian conditions by locating the transit waiting area and transit shelter outside of the primary sidewalk. However, sidewalk stations are typically preferable to boarding islands for pedestrians as they are connected to the primary pedestrian system and adjacent to land uses and activities – boarding islands should only be used where transit runs in center lanes. Transit boarding islands should follow the transit stop layout guidelines above. They should follow all design guidelines and dimensions for Medians and Islands. Amenities such as shelters, seating, signage and TVMs should have a small proﬁle and be arranged along the back edge of the median. Transit shelters should be transparent and should leave 4 feet of clearance in front; this may require removing the sidewalls of the shelter to enable people to pass in front of the shelter. Boarding islands should include dividers between the island and side travel lanes between the island and the curb. Dividers should be designed to contribute to the overall aesthetic of the station. Where traﬃc speeds and volumes are low, dividers may not be necessary, subject to engineering judgment. Boarding islands may include low plantings at the back end of transit boarding islands beyond the pedestrian waiting area. Transit boarding islands should be at least as long as the distance between the front of the vehicle and the rear-most door plus 5 feet. At stops where two or more vehicles are expected to stop simultaneously, the island should be large enough to accommodate all vehicles with 5 feet of space between each pair of stopped vehicles. Transit boarding islands must include a 5-foot wide by 8-foot long clear loading pad or other accessible facility such as a raised platform with ramp for accessible boarding. Accessible boarding facilities will vary based on the type of vehicle using the stop. The median should be designed so that doors used for accessible boarding align with the boarding area. Bulb-outs should be prioritized on transit routes to enhance pedestrian safety and transit operations. At signalized intersections, bulb-outs can extend green time available for transit on the major street by reducing pedestrian crossing times across the major street from side streets. At transit stops, bulb-outs should be full-length bus bulbs, and not a standard corner bulb, as it can be diﬃcult for a bus to exit or re-enter traﬃc around a standard corner bulb-out. Traﬃc calming features on bus routes should be compatible with bus operations. In particular, strategies involving vertical and horizontal deﬂection that could aﬀect transit on-time performance and transit user comfort should not be used, particularly on Rapid and Local routes. Eﬀective corner radii should balance the necessity to accommodate transit vehicles with the need for safe pedestrian crossing conditions.